The Holy Spirit Wood Cremation Urn is made of oak wood and features a simple, traditional design. 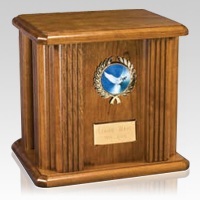 This beautiful urn is accented with an elegant wreath emblem that features a dove in flight. The name plate will add the perfect final touch. A wonderful urn to offer a peaceful final resting place.